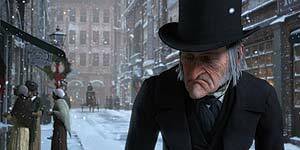 away dissapointed with the lack of Jim Carrey humour and the incredibly frightening 3D images of the 3 spirits and Scrooge's ex partner. We realise that this film is PG but you don't expect a Disney film to be disturbing! My 7 year old jumped out if her seat at times with fear as the ghosts literally leap at you. There were many other young children in the cinema, who probably like us were not expecting the really scary scenes . Even our 11 year old found them disturbing and he is not easily upset. Word of caution- do not take younger children !! !